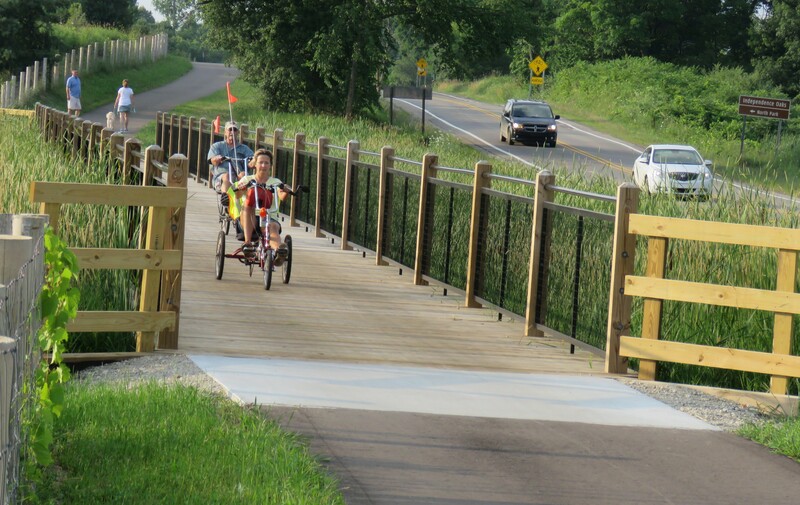 Independence Oaks Safety Path Opens! “My early morning hike of solitude on a sultry summer day at Independence Oaks County Park – North was a magical experience. Wispy cirrus clouds added definition to the clear blue sky. Spider webs sparkled with diamonds of dew. Sandhill cranes trumpeted from a wet meadow. An American Goldfinch and an Eastern Kingbird perched in tree tops to bask in sunlight, as did a Red-tailed Hawk high up on a transmission line tower. The music of crickets, and the rustle of aspen leaves in the morning’s gentle breeze softened the rumble of traffic on nearby Sashabaw Road.” I wrote those words last August as an introduction to a “Wilder Side” blog about Independence Oaks County Park – North; a 188-acre addition to the main section of 1,285-acre Independence Oaks County Park, the largest of the 13 parks managed by Oakland County Parks. Independence Oaks – North is the only Southeast Michigan park with a catch and release special designation by the Michigan Department of Natural Resources. The park also includes natural features that helped the site be classified by the Michigan Natural Features Inventory as a Priority One Conservation Area. After last year’s slow-paced, nature-embracing, blackberry-eating 90-minute meander at Independence Oaks – North which included a few exciting moments of watching an osprey fish at Upper Bushman Lake and apparently not practicing catch and release, I headed to the main section of Independence Oaks to spend a few hours of hilly hiking on its extensive trail system. But to reach the main section I had to drive one mile south along Sashabaw Road. All that has changed thanks to the combined efforts of the Independence Township Safety Path Committee and Oakland County Parks. 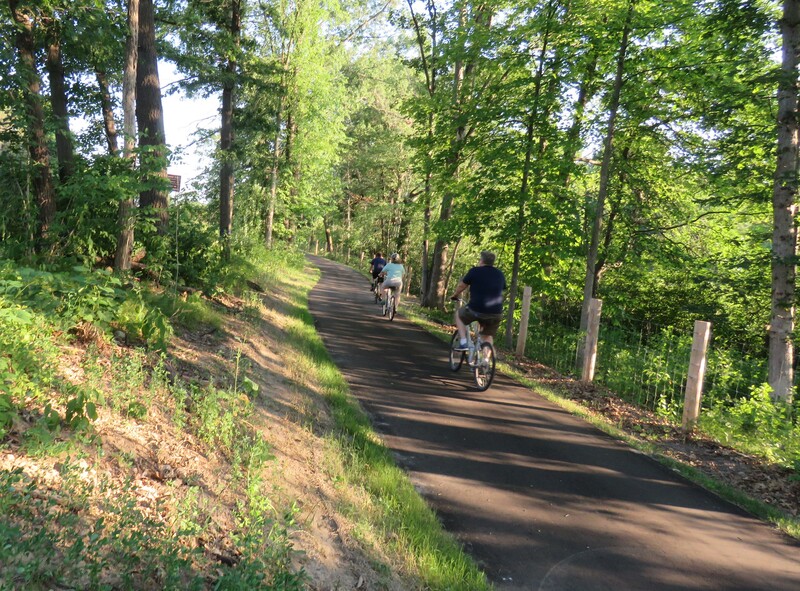 A new safety path: a long-planned collaborative effort between Independence Township and Oakland County Parks, that parallels gently curving Sashabaw Road is now open and was officially dedicated two days ago. Traveling between the main park section and Independence Oaks – North is now much easier and safer for hikers, cyclists, and walkers and perhaps just as importantly, a lot of fun! 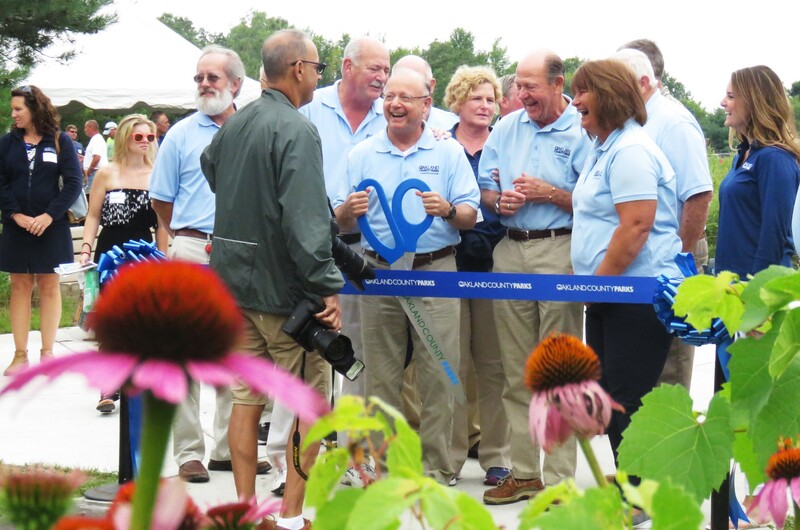 Although the sky was overcast for the August 1st dedication, a small crowd of outdoor enthusiasts and officials from Independence Township, Oakland County Parks, and other project partners were smiling with good reason. The safety path trail was finally a reality. According to Connect Our Future, trail connectivity encourages physical activity, brings people and communities together around shared interests and assets, increases property values of adjacent properties, and along with showcasing and thus protecting important natural resources creates new opportunities for wildlife viewing and passive trailside recreation. 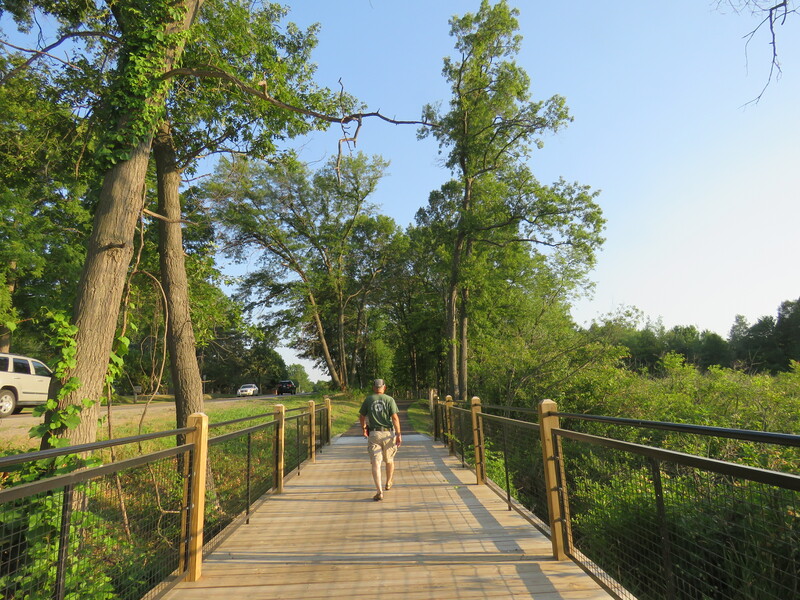 The Independence Oaks Safety Path project includes 870 linear feet of 10’-wide boardwalk sections over beautiful wetland areas along Sashabaw Road between the main entrance of Independence Oaks County Park and the entrance to the Independence Oaks – North. It also offers connectivity between the internal park paths at both sections of Independence Oaks – 12.5 miles of trails within Independence Oaks, some paved, some primitive, and approximately 1/3-mile of trail at Independence North. 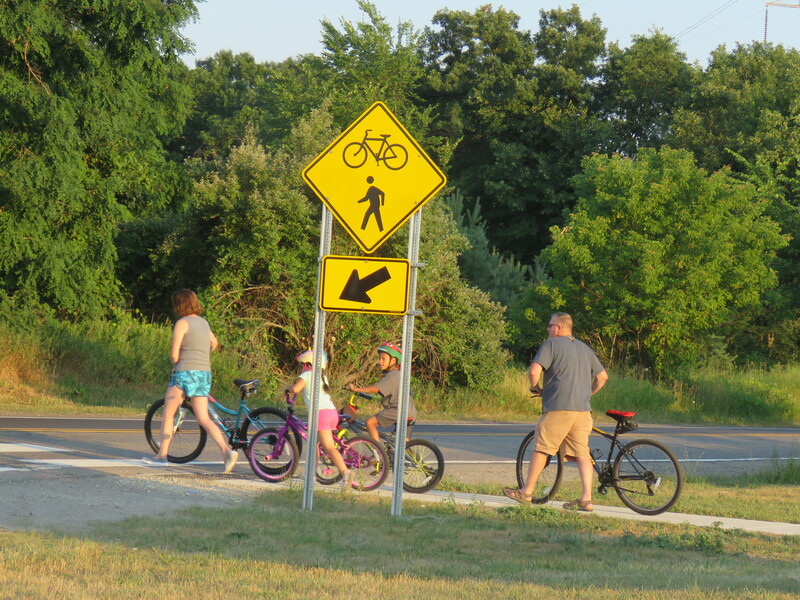 In addition, it’s an important link within Independence Township’s Safety path master plan that connects existing pathways along Oak Hill Road to Independence Township’s Clintonwood Park and the Village of Clarkson via pathways along Sashabaw and Clarkston Roads. Even as Stencil spoke at the dedication being held near the parking lot of Independence Oaks – North, a mom with children in tow peddled on the grassy shoulder of the 8-foot wide asphalt trail and seconds before the ribbon across the trail was about to be cut, a passing cyclist zipped through the official ceremony. 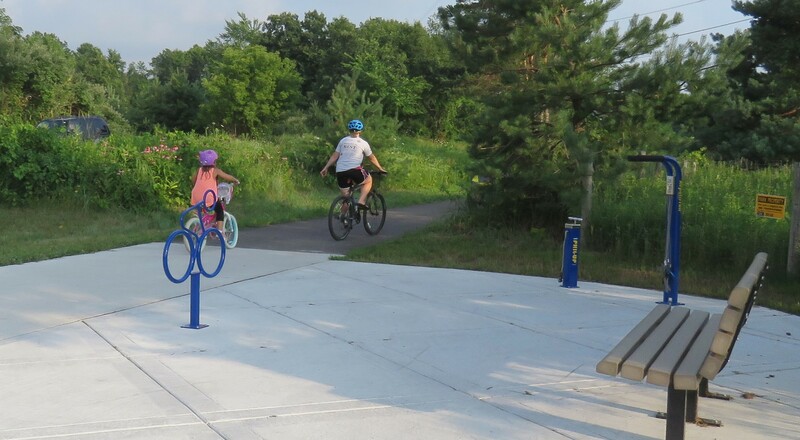 They were not the only eager ones, for the new safety path trail has been a busy place all of July. I will make a confession, I’ve walked the trail a few times during construction on my “scouting expeditions” and a few more times during July before the official opening. Hundreds of others have as well, including at times a steady stream of causal walkers, cyclists of all ages, joggers, and skateboard users. 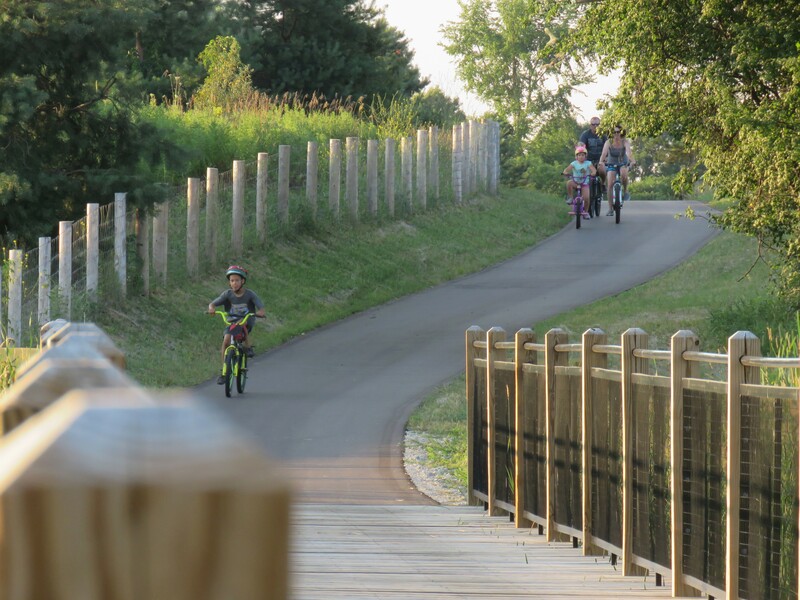 Without a doubt, word of the safety path trail spread weeks before the dedication and it’s already a popular recreation destination. Every hike brought friendly encounters with users and opportunities for wildlife photographing especially at and near the attractive boardwalks. 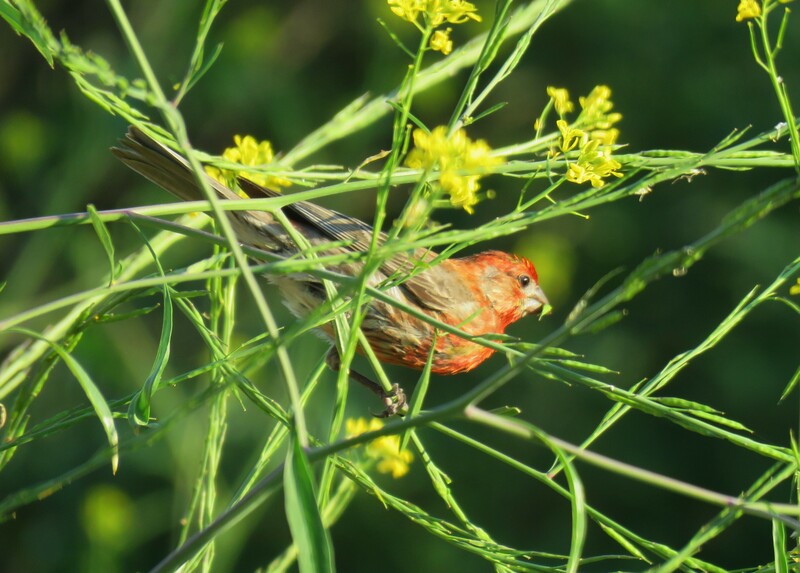 I watched colorful house finches in shrubbery along the boardwalks, Red-tailed hawks soaring overhead, deer in the distant fields and a Blanding’s turtle down amidst a thick growth of buttonbush that was alive with honey bees. Purple coneflowers and Black-eyed Susans are just two of the more colorful wildflowers that grow along the trail’s northern edge and attract butterflies. Summer will soon fade and as autumn colors paint the woods of Independence Oaks in fiery hues of orange and red, I foresee a surge of cool season usage on this great new addition that for many will be a their portal to one of the most popular parks and lands beyond of the wilder side of Oakland County. More good news: Plans for additional connectivity continue, including a possible direct internal trail link from Independence Oaks to Clintonwood Park. That will be a trail tale for another day. For more information on Independence Oaks County Park explore their website.